I remember being sat down in Kalymnos a couple of years back with mine and Pete's family thinking - What would Dave Binney do? After all, Dave had been a strong influence in both of our climbing approaches; Pete through his younger years in the GB Juniors and mine as a coach for the GB Team. So, what would we do....? 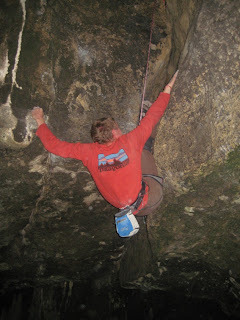 The resounding answer was to build a cellar like no other; no crimps, no pinches, no 45 board and no campus board. Instead I strapped to the underside of my house two different sizes of offwidth roof crack, a massive long 35ft hand crack, a 45 degree double fist offwidth and a knee-bar sit up machine. With this strange DIY task completed, we then set about getting psyched. Very psyched indeed. I've had sessions down there where after dropping from the multiple laps I could no longer walk properly, my legs and stomach were filled with so much lactic acid. I've seen Pete turn into a mushy mess where he's hardly managing to talk any more and his back has turned a colour so red that you'd have thought he would pass out from blood loss to the brain. We've broken ourselves down in that cellar and we've been happy to do it, because if you want to make a difference, it's gonna hurt. So where has all this taken us? I think (and I'm starting to believe it now) it's achieved for us that new level that we'd previously hoped for - the Binney Dream of athletic development through focused training. 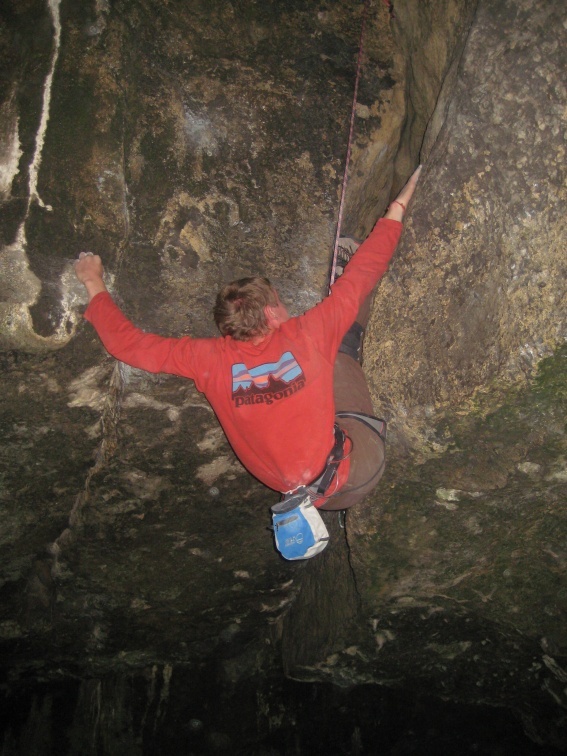 Where previously we'd been happy to do laps on the equivalent of 8a's down the cellar, we can now do them with huge weights vests or with 6c cruxes thrown in every 5 moves to increase the intensity of a 100 move circuit. It's still scary though, to wonder what it'll all be like when we go over to the States and actually do some of this stuff that we've dreamed of for so long. This weekend we headed out to Harborough Rocks with Rocketman Rob Smith to do some mileage on probably the UK's hardest offwidth, Gobbler's Roof (E7 6c). 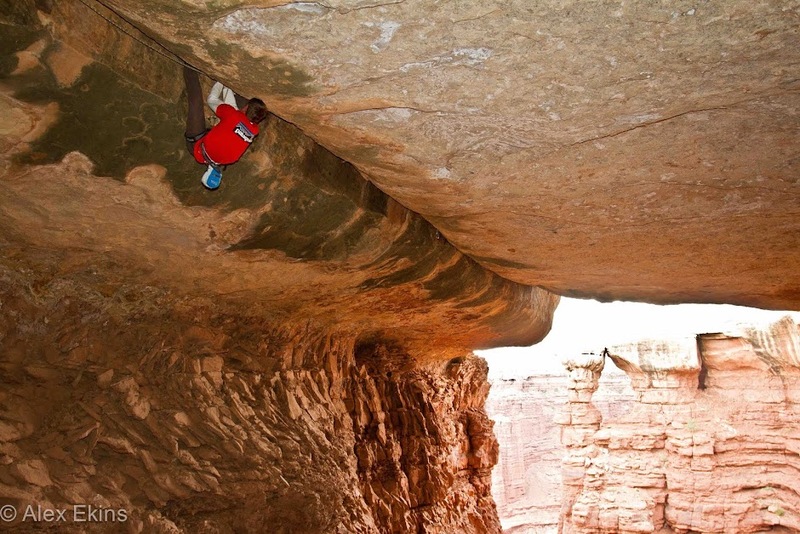 It's a filthy, dirty and dark offwidth roof crack that's probably about 8a to climb if you had to give it a sport grade and is whole new level above stuff like Ray's and Giggling. Fortunately (given how much effort we've ploughed into the training) the route feels very reasonable now and it was great to feel the gains on some real rock and not just 2 pieces of kitchen sideboard bolted 7 inches apart! It was also great to see Rocketman on this route as well - in fact it was just good to go out climbing with him as he's so motivated! It's pretty rare that you meet other people out there that are so versatile with their styles of climbing and good at it too. I think when we go back for some filming with the Hotaches crew in a couple of weeks he'll definitely get the 3rd ascent of this filth-fest. Go on Rob! In terms of understanding pain and endurance you should try a proper activity like fell running, "I've seen Pete turn into a mushy mess where he's hardly managing to talk any more", spare me! Last year on the BG I was like that after 10 hrs but almost passed out after finishing in 25 hrs. This year after nailing it in 19 and half hours I had to lie down in the pub, and someone was worried because they thought I was dying. You boyz are just playing with perceived limits! I'm really interested in your training and how you build your DIY crack-contraptions. Did you have somesort of schedule, and if so would you enlighten us? You guys are a great inspiration to climbing and how training doesn't mean you need to live at the crag. How exactly does one go about making a knee-bar sit up machine? Should I get a puppy or an adult dog? Older dogs usually have more even temperaments than puppies and with an older CBD oil for dogs you get what you see. An older dog may also be a better dog for a household with children as puppies can be very rambunctious. Where's the best place to get a dog? Which breed of dog should I get? After a winter in which I may have overindulged yet again, the consequences were beginning to show themselves. At first I thought I was in the clear as my CBD gummies for sale had been largely unaffected (cleaning the snow off my car had proved excellent additional exercise).